A really economic UT scanning system for your lab. The ECO UT tank system is a cost effective solution for most feasibility studies. It has a simple and robust design, manufactured with aluminium and stainless steel. 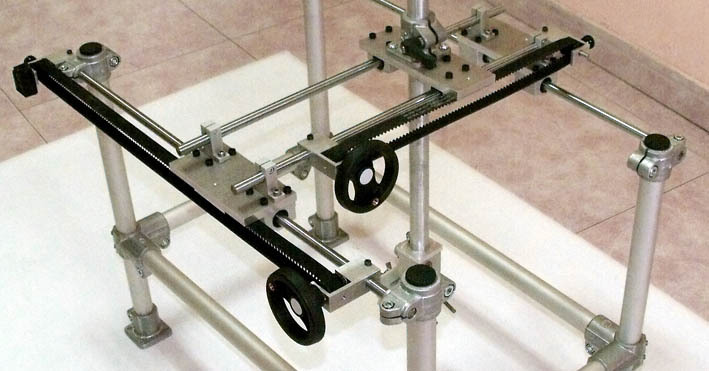 Its toothed pulleys allow continuous recording of the X or Y position with a maximum resolution of 0.02 mm, using a quadrature encoders compatible with Ultrascope, Difrascope and SITAU series. Includes a very stable locking system for fixing one or both axes. The Advance version of ECO UT includes motorized X and Y axes with high resolution stepper motors, whose can be controlled via Bluetooth with an Android application. • Attach interchangeable transducers: conventional and Phased array. • Smooth motion, compact and lightweight. • Total weight < 5 kg. • Can be easily disassembled and assembled in less than one hour. ECO UT tank is Not Sold as a single item, you must have purchased an Ultrascope / Difrascope / SITAU system.